I have been quite busy working on portraits of horses and dogs that clients would like to give as Christmas gifts. Finding it fun to work from their photos and challenging at the same time, hoping to capture what each animal means to their family on paper. This is a section of the painting I am working on now. It is 16 by 20 inches on Arches 140 pound cold press. From the portion you've posted, it looks good. I am sure they will love their gift! Pat, it is such an honor that people let me put their animal friends to paper, now as long as I don't forget to make a Thanksgiving dinner....and get Christmas cards out! It looks amazing so far! Can't wait to see the whole painting :) Love the suspense in the waiting! Me encantan tus animales, pero el basset es genial. Felicidades!!!!!!! Thanks Jen, this is a very big painting for me, now going smaller seems so...well ....small! 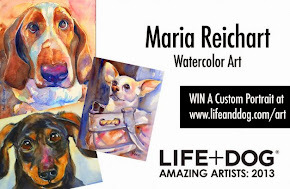 Maria, I'm so happy that you are getting commissions! It's a great feeling isn't it? 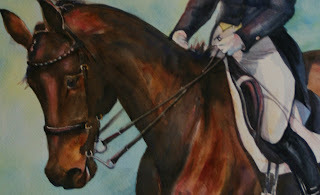 This horse portrait is amazing! You are so talented!